America’s best-loved therapist Dr. Ruth K. Westheimer returns to the park for an afternoon discussion of her latest book, The Doctor Is In: Dr. Ruth on Love, Life, and Joie de Vivre in which she shares private stories from her past and her present, and her insights into living life to the fullest, at any age. Ruth K. Westheimer is currently considered a "single author." If one or more works are by a distinct, homonymous authors, go ahead and split the author. 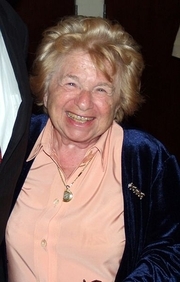 Ruth K. Westheimer is composed of 13 names. You can examine and separate out names.